Let’s do something special on weekends rather than the usual boring stuff like brunching, hangout, shopping, movies, café hopping and blah blah. Well, I am trying to learn new skills, explore new things and just curious perhaps discover new talent in me. Well, I had an opportunity to attend EJS Jewellery Making Workshop By Elegant Jewellery Studio at Books Kinokuniya, Suria KLCC on Sunday. Jewellery has the power that makes us feel unique, moreover the masterpiece that we created for ourselves or for someone special. So here we are determine to learn, have fun and create our own Christmas jewelries on Sunday morning at Books Kinokuniya, Suria KLCC. do you like their christmas charms? This was my first jewellery making class and glad that we were under the guidance of Angie Ng, she is the Founder and Master Creator of Elegant Jewellery Studio (EJS) is a Jewellery Making Academy established back in early 2013. Angie gave us a quick briefing about EJS and then started to show us the steps how to create our own charm bracelet. Started with the measuring the length of the bracelet, to choosing the charms, organizing the charms and at last fixing each charm onto the bracelet. She did it so fast and smooth while I was like struggling to fix every charm. But I enjoyed the learning process. It not easy so we should appreciate all the handmade stuff. Well, in between Angie helped and showed me the easier way to do it. Angie is very passionate and travelled all over the world to learn from top notch designers, sourced for materials from the most common of pearls to Mexican opals and black diamonds - the most expensive of its kind. She is highly regarded by many as one of the experts in the industry. Tadah! Finally I managed to complete my charm bracelet and also I created a pair of earrings. So proud of myself! And I shall wear it to Christmas party. The jewellery making workshops is opened to all including make as well. All tools and materials are provided by EJS. All you need to do is turn up and enjoy yourself. Now EJS also has special Jewellery Making Workhops such as EJS Charm Bracelet Making, Basic Jewellery Making, Lollipop Making, Watch Making plus Children Jewellery Making workshops at Books Kinokuniya on Sunday morning from Jan 2015 onwards. Do check out their website and facebook for details and updates. EJS offers various levels of jewellery making and designing courses, from beginners to professionals, for amateurs and hobbyists, children and adults. For Beginners and Master classes – a series of workshops and classes, starting from the basic. For those who are interested in learning all about professional skills and techniques. Certification will be provided upon completion of each level. Hobby classes – one-time class for those who are interested to work on a project basis and Young Master classes – suitable for children age 7 and above. All classes are conducted on Tuesdays and Saturdays, from 11am to 4pm at Kelvin Gems which is located in Wisma Amoda, Kuala Lumpur. Besides conducting Jewellery Making workshops and classes, Angie also has her private label called Crafted by Angie has been supplying to corporate as well as individual clients, ranging from diamond engagement rings to customized jewelleries for the past 15 years. Plus she is also the Creative Director of Kelvin Gems www.kelvingems.com which is a jewellery brand that has been around for almost four decades. One occasion I happened to witness a man selling handmade jewelries along the street, especially during a local festivities or special occasion for that matter which a municipality or city is celebrating every year. I was amused on how he made his jewelries which became salable. I watched him attentively as he was working. Then in a moment or so he came up with a unique jewelry. This is very interesting activity. Keep it uo. It's great that workshops such as these are increasing over the years. It gives opportunities to those people who wants to learn but don't either have the budget to enroll in a school or don't have the right resources like books, etc. :) Keep up the good work! Wow, it's such an interesting event! But I'll probably be totally stressed out if I were to try this though. Not very good at doing intricate stuff. Looks like fun to do. I am a fan of intricate designs and stuff. Wow! Jewellery workshop it sounds great. It may be more attractive to women. Any way the pictures are wonderful. 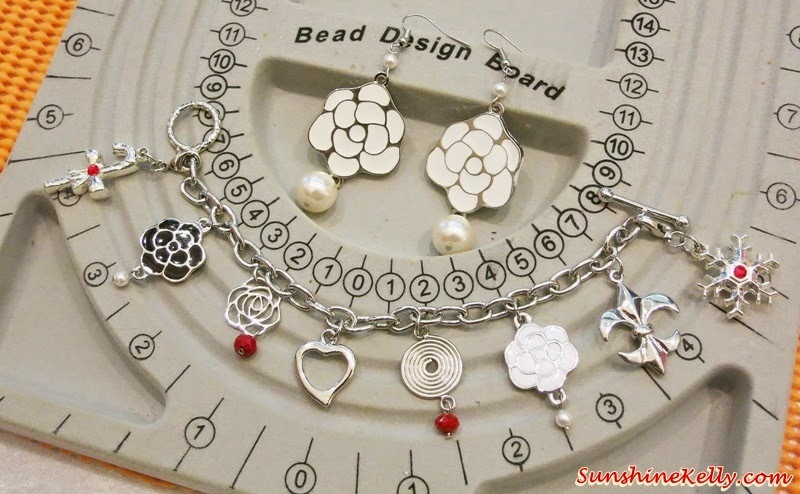 I did not know that there is a separate tool to measure the length of necklaces and bracelets. I like how organized the workstation of a jewelry maker is. So happy for you for finishing that charm bracelet! I used to make my own jewelry too, then i got too busy with school. Your post has inspired me to open my jewelry toolboxes and start crafting again! i think creating this charms and jewelry is an exciting experience. You can really customize it based on your preference. It amazes me how girls can be so creative. My sister would love an event like this. Good job on your creation! Congrats! Jewelry making can be very relaxing and I should take a class in 2015. I bought a kit a few months ago and got bored because I didn't know what I was doing. This looks like a lot more fun. Glad u enjoy ur session there. Lovely masterpiece of yours. I myself love creative workshops, and making jewels from beads is my passion too, I love the Christmas Santa Clause beads, this workshop would be so much fun for me to attend! This is something I want to learn! Though not really for men, but I think this is cool and highly addictive im sure!